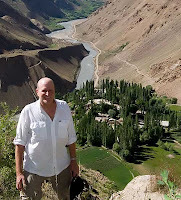 Richard Hughes at the storied Kuh-i-Lal spinel mines, which lie high on a mountain above the Panj (Pamir) River, which separates Afghanistan (left) from Tajikistan (right). Photo: Dana Schorr. A native of the United States, Richard Hughes has spent many years in Asia, where his interest in precious stones was first kindled. Richard graduated from Bangkok's Asian Institute of Gemological Sciences in 1979; shortly thereafter he was invited to join their staff. He was later appointed executive vice-president, a position he held for close to a decade. Today he is Gemological Administrator and Webmaster at the American Gem Trade Association Gemological Testing Center. Traveling to scores of countries in search of precious stones, Richard Hughes has authored two books and more than a hundred articles on all aspects of the gem and jewelry trades. His work can be found at ruby-sapphire.com, palagems.com, userblogs.ganoksin.com and agta-gtc.com. Richard is not afraid to speak his mind, displaying an uncanny knack for touching upon controversial subjects, including politics. Agree or disagree, there is no question his writings and lectures are among the most passionate in the world of gems, which is perhaps why his work has attracted such a strong following. You have been to places that most people will never have the opportunity to visit from Burma, Chanthaburi, Sri Lanka and Nepal...to Kathmandu! What affect has this first hand experience had on your work in the laboratory? In my opinion, there is no substitute for hands’ on experience, and for natural gemstones this necessarily begins at the mines. Be it origin determination or separating natural from treated or synthetic gems, it all begins at the source. If you had the chance to do it again, what would you do differently...more formal training? less? wider range? I wouldn’t change a thing. Moving to Asia at such a young age allowed me to experience gemstones at a level most just dream about. And now that I’ve had the chance to work in a well-equipped lab, I appreciate how valuable hands-on experience at the source can be. You have worked with a number of prestigious companies and laboratories in the Gem Industry...tell us about your current postion at AGTA? I am involved in serious gem testing, which means preparing lab reports. Natural vs. treated vs. synthetic and origins. We all have one aspect of our job that we like most...what is your favorite part of the gem grading process? Using the microscope. Every day is like Sunday when looking at gems in the microscope, and I’m fortunate that I specialize in corundums, which are among the most interesting in the microscope. I noticed recently that the major gem labs are now doing gem reports that determine the regional origin of the stone? How does that work? Origin determination involves a bit of science and a whole lot of experience in looking at gems from around the world. What is a gemologist and what are some of the employment opportunities for someone with certification in this field? A gemologist is simply one who practices gemology, which is a knowledge of gems. The opportunities in this field are wide open, from the mines to markets to the jewelry store. That would be a long list. In this field, I’ve had a number of heroes. G.F. Kunz and Edward Gübelin for their literate writings on precious stones, John Koivula for his photomicrographs, Alan Hodgekinson for his shoestring gemology, Bill Larson and Vincent Pardieu for their passion for the subject, John Sinkankas for his love of the subject’s literature. Bernd Munsteiner for bringing art back to gem cutting. John Emmett for his amazing knowledge of all things scientific. Outside the field, Steve McCurry for his amazing photographs of people, Thom Hartmann for his willingness to listen to others, even those he disagrees with. And of course, my family. I noticed while reading your bio that you worked at Pala...that region is on my list of fieldtrips this Fall. Can you give me any pointers? At Pala the mines are privately owned, and so unless you know the miners it’s difficult to actually visit a working mine. However, the town of Fallbrook has a nice mineral museum, The Collector at Pala International in Fallbrook has a wonderful store with exhibits of gems and minerals, and the GIA is in Carlsbad. San Diego also has a good natural history museum, Mike Scott’s collection is now on display at the Bowers Museum in Santa Ana, and the LA County Museum of Natural History is good as well. So there’s plenty to do here in SoCal. 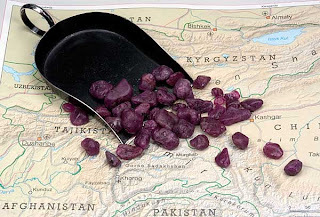 Rough ruby reputed to be from Tajikistan. It was this material which set the authors off on their quest for the source. Photo © Wimon Manorotkul/Pala International. 8.Music: I listen to a wide range, everything from Miles Davis to Madonna, Zawinul to ZZ Top. Much of the inspiration for my writing comes from music, which I listen to constantly. 9. Apple Computers and Steve Jobs. Introducing Prospector Amanda Adkins Anderson From The Weather Channel’s "Prospectors"